Residents of La Feria will continue getting a break on their tax bills following city council approval of the 2018-19 effective tax rate which calls for no increase in property taxes. Frank Rios, the city’s finance director , made the recommendation to adopt the rate during Tuesday’s, Aug. 28 meeting of the council. Earlier, Rios made a brief presentation detailing the taxable value. He said that based on their calculations, the taxable value is of a little more than $223 million and $189 million if it include the tax protests filed and fought by local residents. Rios said the city has a $1.8 million debt that will have to be paid. 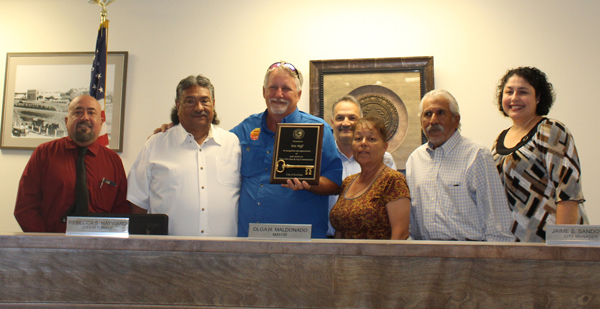 In other business, the council gave former commissioner Eric Hoff a plaque with a symbolic key of the city for his time on the council. Mayor Olga H. Maldonado said Hoff has left his seat and wanted to take the time to thank him for serving on the council. Commissioner Esmeralda Lozano said it was awesome working with Hoff even though there were some disagreements from time to time. Hoff thanked the council, adding he joined the administrative body during a chaotic city government. The council appointed Commissioner Jesse Zuniga as mayor pro tem thus filling another duty held by Hoff. Zuniga, who has been serving on the council for 2 ½ years, said he was dignified for getting the appointment. The council appointed four members to the Texas Municipal League. They are: Randy Criswell, Bert Lumbreras, Byron Black and David Rutledge.